Our Raw Organic Lucuma Powder is a deliciously sweet addition to smoothies, shakes, puddings, ice creams, and more. The fruit of the lucuma tree has been revered since ancient times and lucuma is a favorite flavoring in Peru, Chile, and Ecuador. Our Raw Organic Lucuma Powder is a great source of fiber, vitamins, and minerals and it blends easily into a variety of foods. Our Raw Organic Lucuma (loo-ku-ma) Powder comes from lucuma trees in South America, where the fruit is prized as an amazing source of vitamins, minerals, and dietary fiber. This exotic fruit has a flavor that is similar to cashews and maple: full-bodied and sweet, yet the fruit is naturally low in sugar content. This Peruvian superfruit is extremely high in beta-carotene, iron, and niacin (B3). It was once called “The Gold of the Incas,” and is highly regarded by the indigenous people of Peru for its healing and nutritive properties. 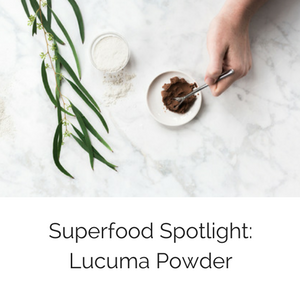 Lucumu powder is relatively new to the northern hemisphere, but is finding popularity among raw dessert chefs. Our Raw Organic Lucuma Powder has flavors that are both rich and delicate, making it a wonderful compliment to ingredients like cacao or vanilla. It can also be enjoyed alone, as its distinguished taste will surely become a quick favorite. The exotic fruit of the lucuma tree has been a culinary prize in South America for thousands of years. In Peruvian culture, it is used as a versatile sweetener and it is the most popular flavor of ice cream. The pulp of the lucuma fruit resembles the orange-yellow flesh of a persimmon, and imparts a sweet fragrance and rich, unique taste. Our organic lucuma powder comes from fruits that fall to the ground naturally, and are allowed to further ripen to maturity until they are most flavorful. Mature fruits are peeled, pitted, and dehydrated at low temperatures to ensure that all of the fruit’s health properties are preserved. The dried lucuma fruit is then gently ground into a fine powder and sifted to provide the finest quality. Our delicious Raw Organic Lucuma Powder blends easily with liquids and can be mixed into baked goods or sprinkled on cereal and granola. The recommended serving size is 1 tablespoon.